"The more I learned, the more I realized how like us they were." National Geographic has unveiled the first official trailer for the documentary titled Jane, telling the story of famous animal lover and animal rights activist Jane Goodall. Made by the same filmmaker behind the doc Cobain: Montage of Heck, Jane features a "trove of unseen footage" from Goodall's life, including recently discovered 16mm footage of her first adventures into the world of chimpanzees in 1962. The film also features a triumphant score by the legendary Phillip Glass, which is kind of wonderful and makes this even more epic. It's really lovely to see all the old footage of a very young Goodall, this looks like an rousing look back at this extraordinary woman. Using a trove of unseen footage, the film tells the story of Jane's early explorations, focusing on her groundbreaking field work, her relationship with cameraman and husband Hugo van Lawick, and the chimpanzees that she studied. 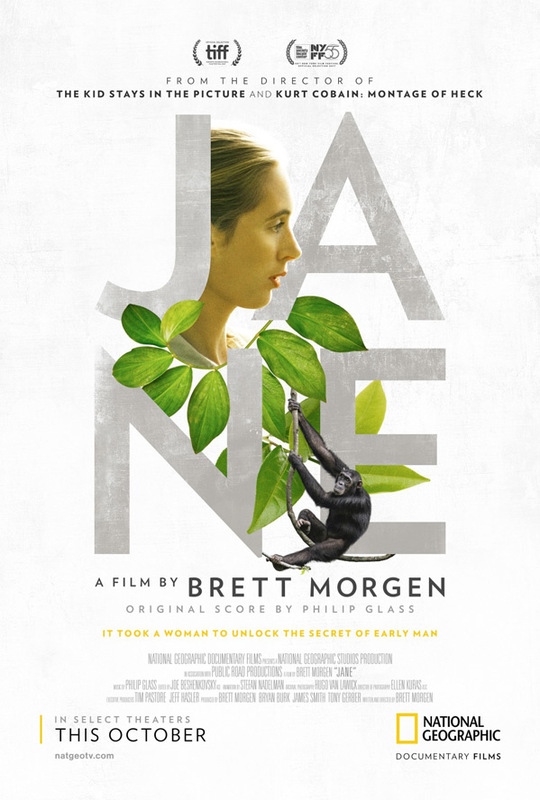 Jane is directed by Oscar-nominated documentarian Brett Morgen, of the documentaries On the Ropes, The Kid Stays in the Picture, Chicago 10, Crossfire Hurricane, and Cobain: Montage of Heck previously. This first premiered at the Toronto Film Festival earlier this month, and it will also play at the New York Film Festival and London Film Festival next. The film will have a special showing at the Hollywood Bowl with a live orchestra conducted by Phillip Glass. National Geographic Documentary Films will then release Jane in select theaters starting October 20th this fall. Who really wants to see it?